Villa del Sol is a newly built 1800 sq.ft. 2 bedroom 2 bath luxury Beach Villa, located in Nosara, Costa Rica. Each Villa is fully Air Conditioned, Equipped Gourmet Kitchen, high speed wireless Internet and satellite TV and is perfect for your Costa Rica vacation getaway. Our Beach Villas accommodate up to 6 people comfortably. Villa del Sol is a quiet enclave of 16 luxury Villas with lush gardens, Large Tropical Pool with Jacuzzi and Pool Cabana located in a Gated Community. Villa del Sol is located only steps to the beach and is truly the most luxurious beach front Villa in Nosara. 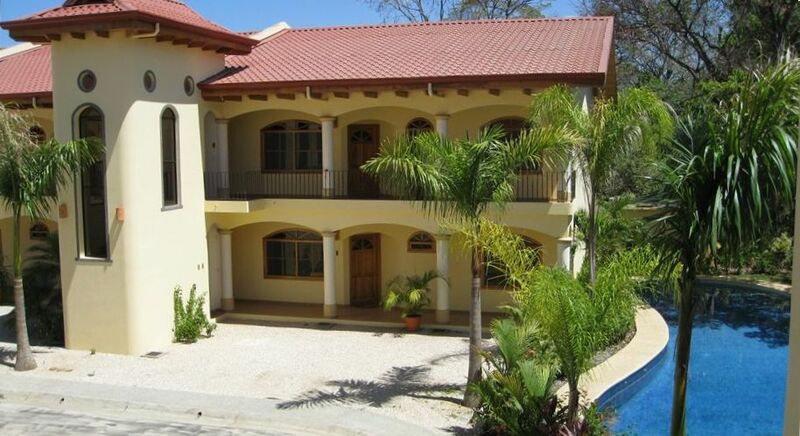 If you are looking for a luxury beach front Villa to rent in Costa Rica, Villa del Sol is a great choice. Villa del Sol received a 4 star rating from Expedia. Our on site manager will make your trip to Nosara worry free. He is a life long resident of Nosara and is fluent in English. Eduardo will help with directions to the Villas, restaurant recommendations, book activities or anything else you might need while visiting Nosara. Villa del Sol is a luxury beach front Villa and is built with the highest quality construction. We hope you choose Villa del Sol for your rental accommodations while visiting beautiful Costa Rica. The Villas have gourmet kitchens: SS appliance package, granite counters, mango wood breakfast bar, built in wine rack. Nothing has been overlooked. Thanks for spending time reading about our Villa. We really enjoyed the suite and the screened in back porch was really special. On check in the caretaker was super quick and very helpful getting us settled in. The place was spotlessly clean. Oddly it was missing salt, pepper or any of the very basics for cooking (but all the great pots, pans etc were there). We searched high and low for but couldn't find anything at all. The decor was, well, very unique :). Important to note that this is not beachfront, which it was listed as nor can you see the beach but can just hear it in the distance. It was a five minute walk to the beach which was absolutely stunning and secluded. The pictures are not of the suite we had but perhaps they have several under this listing. If you're going to Nosara, Villa Del Sol is in a great location and it's a safe complex, which was important to us in considering a house to rent. The community is gated, but the gates are left open during the day and closed at night with security, which was great. The accommodations were adequate, but pretty minimalist. The beds and showers were just okay. It's not exactly beach front, but it is a 3 minute walk to a beautiful part of Playa Pelada and you can easily walk down the beach to Olgas and some other spots. Also a quick drive to all the great places in Pelada and Guillones. My husband and I stayed at Villa Del Sol for 8 days. Beautiful property inside and out. Very secure. The caretaker Daniels was very helpful and friendly. Nice pool & BBQ area. The jacuzzi is not a hot tub, it is the same temp as the pool but still very nice. We had a ton of monkeys in the back yard in the mornings and evenings.The small towns of Nosara & Guoines were very nice. The Il Pepperoni was very close and had some amazing food. We stayed at Villa del Sol for a month in February of this year. The condo complex is wonderful and the pool was perfect! It's really close to the beach and several restaurants are within walking distance however, I would recommend that you have a car to get around more. The Village is a quaint little spot as well. Lots of little boutique shopping there and in the next small devlopment. Get a map from Wanderlust Realty, better yet, get 2 so that you can take one home with you. They are perfect and helped us to figure everything out. I rented a bike and rode into the town of Nosara and back almost everyday (11 km) but the main roads can get quite dusty. I would leave at 6am when my husband left for a walk on the beach so there was less traffice at that time. The Tico`s are wonderful people and I miss my morning routine of thanking them for hosing down a portion of the road! We love Nosara and this is a perfect spot for 4 people. The caretaker, Daniel, even washed cars in the am for everyone! Hola! Great place saved the day! I had previously booked the Monte Sienna (Dump) but when I checked in it was flithy and we couldn't stay there. I got on the internet and found these condos less than a mile or two away. We were the only one's there, the units were fantastic and pool area was sublime. Monkeys(howlers) visited the pool area almost every day. Great base camp for turtle nesting visits to Ostional, although the river crossing was iffy early in the week. On site manager was a great guy. I'll stay here again when I return. The best place. Clean, Beautiful, 1 min. walk to beach. I can't WAIT to go back. This place exceeded my expectations. It is fabulous. The condo community is small, clean and very well maintained. Daniel is the on-site care taker. He speaks English, very friendly and helpful even brought us some salt and pepper in the pouring rain. You can't beat the location and the whole town is full of friendly people and neat mom and pop shops and restaurants. Pick up a map in town, $2. It's an animated map with almost every place around. It's a great souvenir and it helped plan our outings. There is so much to do and see. 1 week is barely enough time. I can't wait to go back.